Need to create a website for your sports team or league? As the world’s most popular way to build a website, WordPress is more than capable of creating a sports website. Whether you just want to create a website for a single team to showcase your matches, roster, and more, or you’re looking to create a website for your entire sports league, you have plenty of options to help you get up and running surprisingly quickly. A few examples of sports websites built with WordPress so that you know what types of sites you can create. How to create the basic foundation for your WordPress sports team website. Some specific WordPress themes and plugins that will make it easy to get up and running with all the functionality that you need. Let’s get started so that you can get back on the field (or the ice, or the court…you get it!). For each of these examples, I’ll list the plugins/theme that are powering its core sports functionality. You’ll also see these plugins and themes make another appearance later on in the how-to section. 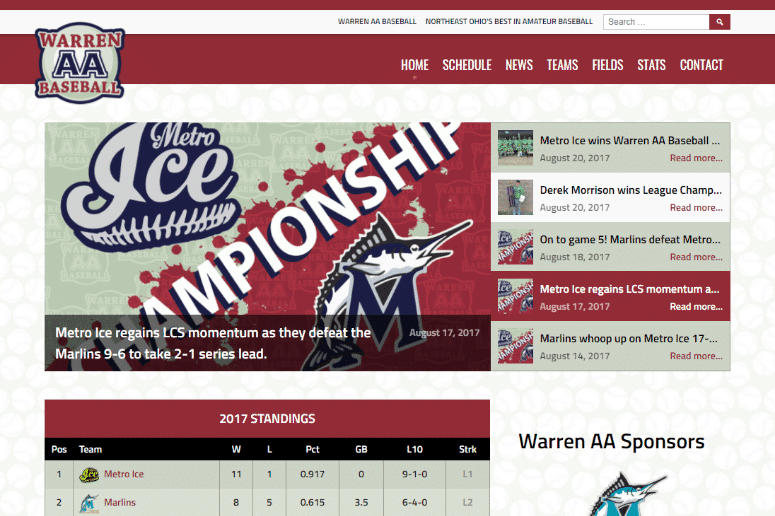 Warren AA Baseball is a great example of how even smaller, amateur leagues and teams can still benefit from a WordPress site. Despite being a small regional amateur league, Warren AA Baseball is still able to showcase schedules, results, stats, and lots more. Warren AA Baseball is powered by the SportsPress Pro plugin from ThemeBoy and ThemeBoy’s Marquee WordPress theme. This example is near and dear to my heart because I live in Vietnam and have been to quite a few VBA basketball games over the years (check out the YouTube page for some highlights!). In addition to an overall league page, the VBA website has sub-websites for each team, stats, game schedules/results, and plenty of other sports league functionality. To build its website, the VBA used WordPress, the Big Slam theme from GoodLayers, and the SportsPress Pro plugin to provide the underlying functionality. 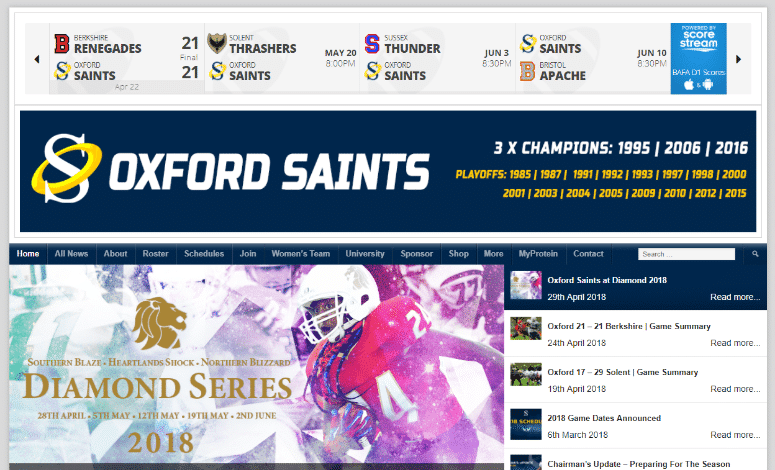 The Oxford Saints is an American Football club in the…UK. They use the SportsPress Pro plugin from ThemeBoy to showcase rosters, player stats, schedules, results, and more. A plugin to handle basic functionality for things like matches, rosters, stats, etc. They preinstall the WordPress software for you, which makes it simple to get started. Your site will load surprisingly fast for the money that you spend. They offer great support if you run into any issues. To get started, just sign up for a SiteGround WordPress hosting plan. Then, their setup wizard will help you get WordPress installed in no time. While there are other WordPress sports plugins, SportsPress is definitely the industry standard nowadays (you’ll notice that it popped up on all three sports website examples above). This freemium plugin has a 4.9-star rating on over 270 votes, which is quite impressive as far as WordPress plugins go. SportsPress won’t make your website look “nice” by itself (you’ll pick a SportsPress-compatible theme in the next section to do that), but it does provide all the underlying functionality that you need to power your sports team website. You can even choose from preset “equations” to calculate stats and standings, or create your own equations. 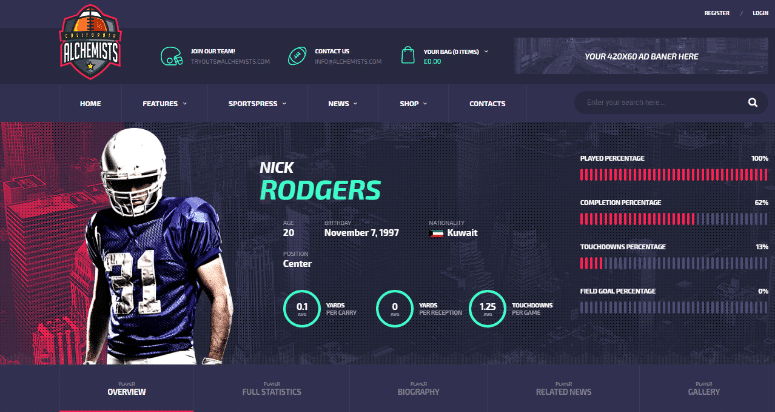 While the free version will probably work for a basic sports team website, if you’re serious about your team’s website (or making a website for an entire league), you’ll almost certainly want the additional functionality in SportsPress Pro. In fact, every example that I looked at was using the Pro version. You can also extend your sports website with sales platform WooCommerce. This will let you sell merchandise through your website. You can extend this even further: if you need to create a private wholesale area, categorize merchandise for separate teams or sell customer-specific products, use the WooCommerce Password Protected Categories. You’ll find more examples of user-specific products for your sports brand here. Because SportsPress is the de facto standard for creating a sports team website, you can find a huge variety of WordPress themes to pair with it. ThemeBoy, the developer behind SportsPress, sells some of their own themes. 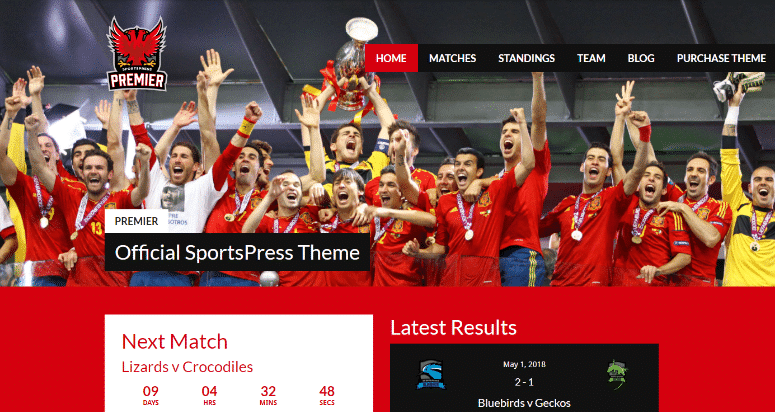 And you can also find SportsPress-compatible WordPress themes from third-party developers. Here are some good WordPress sports themes to get you started. Premier is an official SportsPress theme that can easily be adapted to a variety of different sports. One thing that I like is it includes a countdown timer until the next match, which builds some excitement with your fans. 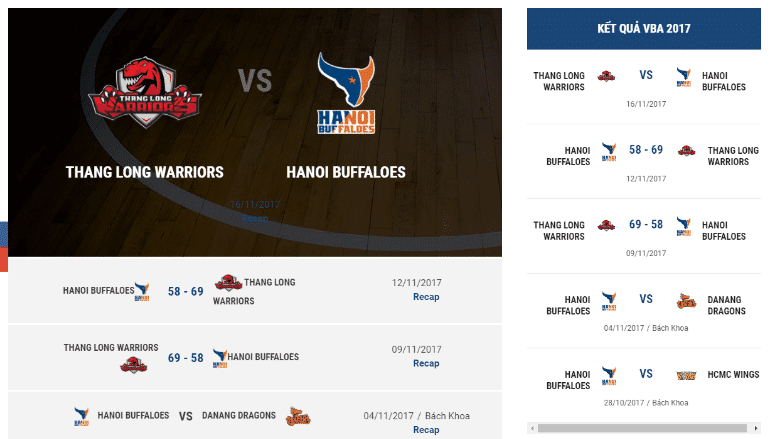 Big Slam is the theme used by the Vietnam Basketball Association website I showed you above. It comes from a popular ThemeForest developer (GoodLayers) and is fully compatible with the SportsPress plugin. Alchemists is a theme from dan_fisher that offers a really awesome modern design. My favorite part of this theme is the player profile pages, which you can see pictured above. Those stat counters are simply awesome! 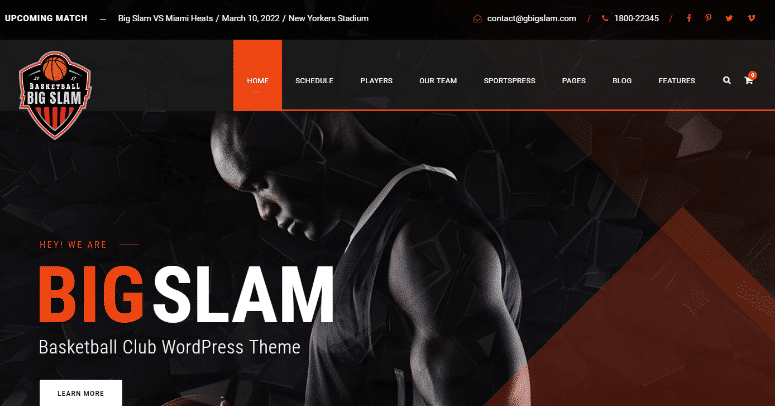 Splash is a SportsPress compatible WordPress theme for basketball, baseball, football, and soccer teams. In fact, it comes with a different demo for each sport to help you get up and running. Marquee is another official SportsPress theme. Whereas the Premier theme focuses more on visuals, Marquee is especially stat-focused, which makes it great if your sport is stat-obsessed (baseball comes to mind). This is the theme that the Warren AA Baseball example I showed you above is using. 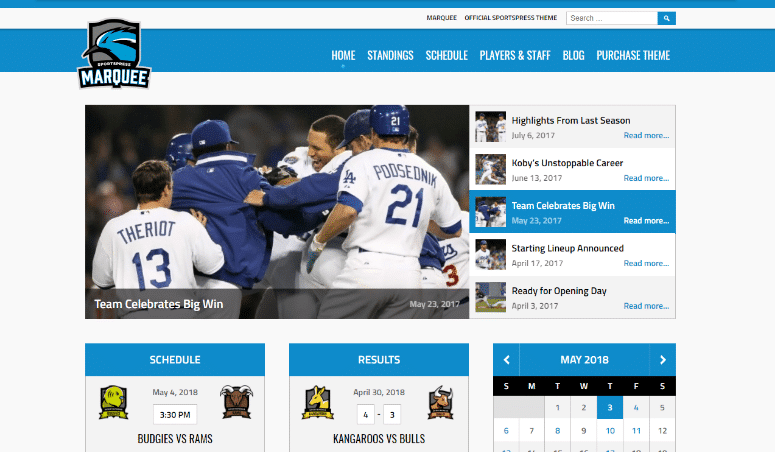 By combining WordPress, SportsPress, and a SportsPress compatible theme, you’ll be able to quickly create a website for your sports team or league that has all the information your fans need to get engaged. 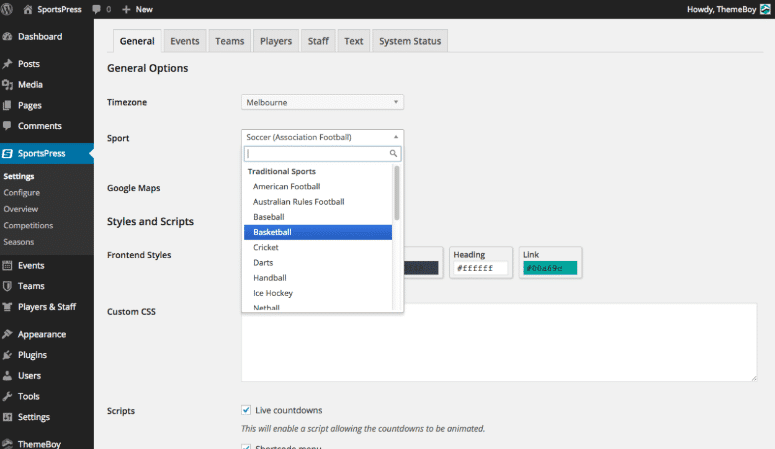 Have any other questions about to create a sports website with WordPress? Leave a comment and we’ll try to help out!